By: Dr. Homayoon Kazerooni et. al. Many places in the world are too rugged or enclosed for vehicles to access. Even today, material transport to such areas is limited to manual labor and beasts of burden. Modern advancements in wearable robotics may make those methods obsolete. Lower extremity exoskeletons seek to supplement the intelligence and sensory systems of a human with the significant strength and endurance of a pair of wearable robotic legs that support a payload. This article first outlines the use of Clinical Gait Analysis data as the framework for the design of such a system at UC Berkeley. This data is used to design the exoskeleton degrees of freedom and size its actuators. It will then give an overview of one of the control schemes implemented on the BLEEX. The control algorithm described here increases the system closed loop sensitivity to its wearer's forces and torques without any measurement fromthe wearer (such as force, position, or electromyogram signal). The control algorithm uses the inverse dynamics of the exoskeleton, scaled by a number smaller than unity, as a positive feedback controller. This controller almost destabilizes the system since it leads to an overall loop gain slightly smaller than unity and results in a large sensitivity to all wearer's forces and torques thereby allowing the exoskeleton to shadow its wearer. Material transport has been dominated by wheeled vehicles, but many environments such as stairs are simply too treacherous for them to negotiate. Many attempts have been made to develop legged robots capable of navigating such terrain (Raibert 1986). Unfortunately, difficult terrain taxes not only the kinematical capabilities of such systems, but also the sensory, path planning, and balancing abilities of even the most state-of-the-art robots. Lower extremity exoskeletons seek to circumvent the limitations on autonomous legged robots by adding a human operator to the system. These systems augment human strength and endurance during locomotion. 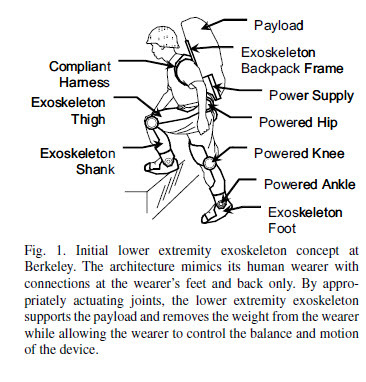 The first load-carrying, field-operational and energetically autonomous lower extremity exoskeleton was designed and built at Berkeley and is commonly referred to as BLEEX. It consists of two powered anthropomorphic legs, a power unit, and a backpack-like frame on which heavy loads can be mounted. This system allows its wearer to carry significant loads with minimal effort. Because the pilot can do this for extended periods of time without reducing his/her agility, the BLEEX increases the physical effectiveness of the pilot. In this initial model, BLEEX offers a payload capacity of 75 lbs (34 kg), with any excess payload being supported by the pilot. The BLEEX lets soldiers, disaster relief workers, firefighters, and other emergency personnel carry major loads without the strain associated with demanding labor. It is our vision that the BLEEX will provide a versatile load transport platform for mission-critical equipment. Although autonomous robotic systems perform remarkably in structured environments like factories, integrated human- robotic systems are superior in unstructured environments that demand significant adaptation. In our research work at Berkeley, the problems of upper- and lower-extremity human power augmentation were tackled separately. The reasons for this were two-fold; first, there are many immediate applications for stand-alone lower- and upper-extremity exoskeletons. Second, exoskeleton research is still in its early stages, and further research is required before integration of upper- and lowerextremity exoskeletons can be attempted. In the mid-1980s, we initiated several research projects on upper extremity exoskeleton systems, billed as "human extenders." The main function of these was human power augmentation for manipulation of heavy and bulky objects (Kazerooni 1990, 1996; Kazerooni and Guo 1993).When a worker uses an upper extremity exoskeleton to move a load, the device bears the bulk of the weight while transferring a scaled-down load to the user. In this fashion, the worker can still sense the load's weight and judge his/her movements accordingly, but the force he/she feels is greatly reduced. Since upper extremity exoskeletons are mostly used for factory floors, warehouses, and distribution centers, they are hung from overhead cranes. Lower extremity exoskeletons focus on supporting and carrying heavy payloads on the operator's back (like a backpack) during long distance locomotion. In the early 1960s, the Defense Department expressed interest in the development of a man-amplifier, a "powered suit of armor" which would augment soldiers' lifting and carrying capabilities. In 1962, the Air Force had the Cornell Aeronautical Laboratory study the feasibility of using a master- slave robotic system as a man-amplifier. In later work, Cornell determined that an exoskeleton, an external structure in the shape of the human body which has far fewer degrees of freedom than a human, could accomplish most desired tasks (Mizen 1965). From 1960 to 1971, General Electric developed and tested a prototype man-amplifier, a master- slave system called the Hardiman (GEC 1968, 1969; Groshaw 1969; Makinson 1971; Mosher 1970). The Hardiman was a set of overlapping exoskeletons worn by a human operator. The outer exoskeleton (the slave) followed the motions of the inner exoskeleton (the master), which followed the motions of the human operator. All these studies found that duplicating all human motions and using master-slave systems were not practical. Additionally, difficulties in human sensing and system complexity kept it from walking. Several exoskeletons were developed at the University of Belgrade in the 1960s and 1970s to aid paraplegics (Vukobratovic et al. 1972; Hristic and Vukobratovic 1973). Although these early devices were limited to predefined motions and had limited success, balancing algorithms developed for them are still used in many bipedal robots (Hirai et al. 1998). The "RoboKnee" is a powered knee brace that functions in parallel to the wearer's knee and transfers load to the wearer's ankle (not to the ground) (Pratt et al. 2004). "HAL" is an orthosis, connected to thighs and shanks, that moves a patient's legs as a function of the EMG signals measured from the wearer (Kawamoto and Sankai 2002; Kawamoto et al. 2003). The Berkeley Lower Extremity Exoskeleton (BLEEX) is not an orthosis or a brace; unlike the above systems it is designed to carry a heavy load by transferring the load weight to the ground (not to the wearer). BLEEX has four new features. First, novel control architecture was developed that controls the exoskeleton through measurements of the exoskeleton itself (Kazerooni and Steger 2006). This eliminated problematic human induced instability (Kazerooni and Guo 1993) due to sensing the human force. Second, a series of high specific power and specific energy power supplies were developed that were small enough to make BLEEX a true field-operational system (Raade and Kazerooni 2004). In particular a fuel based power supply was designed and built that generated electric and hydraulic power simultaneously (Amundson et al. 2005). Third, a body LAN (Local Area Network) with a special communication protocol and hardware were developed to simplify and reduce the cabling task of all the sensors and actuators needed for exoskeleton control (Kim et al. 2004; Kim and Kazerooni 2004). Finally, a flexible and versatile architecture was chosen to decrease complexity and power consumption. This paper describes the biomimetic design of BLEEX and its control algorithm. An anthropomorphic architecture with similar kinematics to a human was chosen for BLEEX. Thus, the exoskeleton has ankle, knee, and hip joints similar to human legs. BLEEX rigidly attaches to the operator at the feet via custom boots and bindings and at the torso through a custom vest. Other connections between pilot and device were allowed, but only if they were compliant so that load does not transfer to the pilot. The exoskeleton legs can therefore follow the human's, but are not required to match exactly since there are only two rigid attachments between human and exoskeleton. The connection at the torso is made using a custom vest which allows the distribution of the forces between BLEEX and the pilot, thereby preventing abrasion. These vests are made of several hard surfaces that are compliantly connected to each other us ing thick fabric. The vests include rigid plates on their backs for connection to the BLEEX spine. Each BLEEX leg has three degrees of freedom at the hip, one degree of freedom at the knee, and three degrees of freedom at the ankle. Both the flexion-extension and abduction-adduction degrees of freedom at the hip are actuated, as is one flexion-extension degree of freedom at the knee, and the ankle plantar-dorsi flexion (in the sagittal plane). The other three degrees of freedom (i.e., rotation and abduction-adduction at the ankle and rotation at the hip) are equipped with passive impedances using steel springs and elastomers. In total, each BLEEX leg has four powered degrees of freedom: hip joint, knee joint and ankle joint in sagittal plane and a hip abduction-adduction joint. In comparison with the movements in the sagittal plane, the actuators for hip abduction-adduction do not contribute to system control during level ground walking. 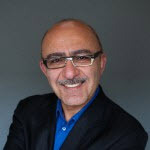 Dr. Homayoon Kazerooni is one of the world's leading experts in Robotics Human Augmentation and has over 30 years of Mechanical Engineering experience. He holds a Doctorate in Mechanical Engineering from MIT. Dr. Kazerooni is a Professor in the Mechanical Engineering Department at the University of California, Berkeley, and is the director of the Berkeley Robotics and Human Engineering Laboratory, affectionately known as "KAZ LAB".